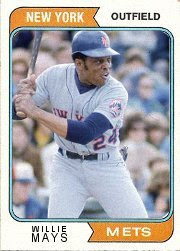 Anyways, yet again Topps dropped the ball in 1974 when they failed to release a Willie Mays card for his final season. 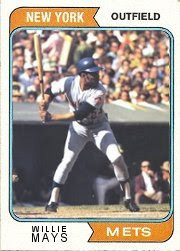 Say Hey was a sure fire HOFer, and despite his lackluster stats in 1973, he should have had a card. Heck, he even played in the World Series against the A's that year! The top three home run leaders of all time all began and finished their careers in the same town, but on different teams. Who and what are they? Version 2 - Straight out of the 74 set! Version 3 - Close up shot! As always, I am taking requests! Those are some killer sideburns that Willie is sporting. I'd love to see a 1978 card of Boog Powell as a Dodger. But finding a photo of him as a Dodger is not easy. Dude, nice! I really like #2, it really does look like it's from that set. Could you do a 1990 Topps Mike Schmidt please? It would be nice to have a fourth card where Mays is stumbling and falling all over himself in the outfield during the World Series that year. These are all great cards, but in more than one post, you mention that "Topps failed to release a card in the player's final season". Mays' final season was 1973, not 1974. Same with Koufax: his final season was 1966, not 1967. 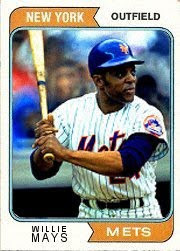 Topps typically didn't issue a card for a player after he retired.